Benvenuto! I am “souper” thrilled to invite you to tour our Italian Dinner Feast. 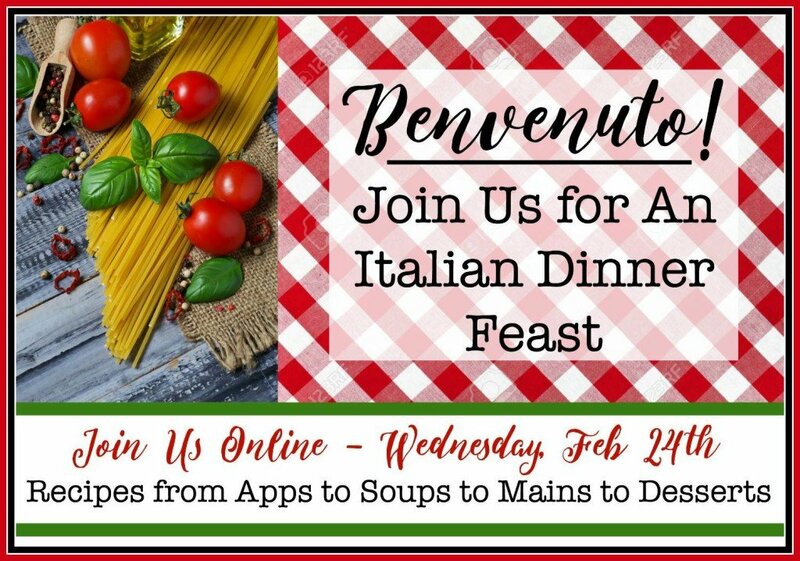 This Italian Dinner Blog Hop has a little something for everyone – from Italian themed printables to all sorts of recipes from appetizers to soups to main dishes and, of course, desserts! A true Italian feast. You’ll want to be sure to hop around and visit each of these talented bloggers. They’ve worked really hard to put together this Italian Dinner Feast and I’m sure you’ll be inspired! Italian Dinner Feast Place Cards – A Free Printable! I’m sharing with you today my Italian Dinner Feast Place Cards. This is a free printable that I designed just for you and with this Italian themed blog hop in mind. 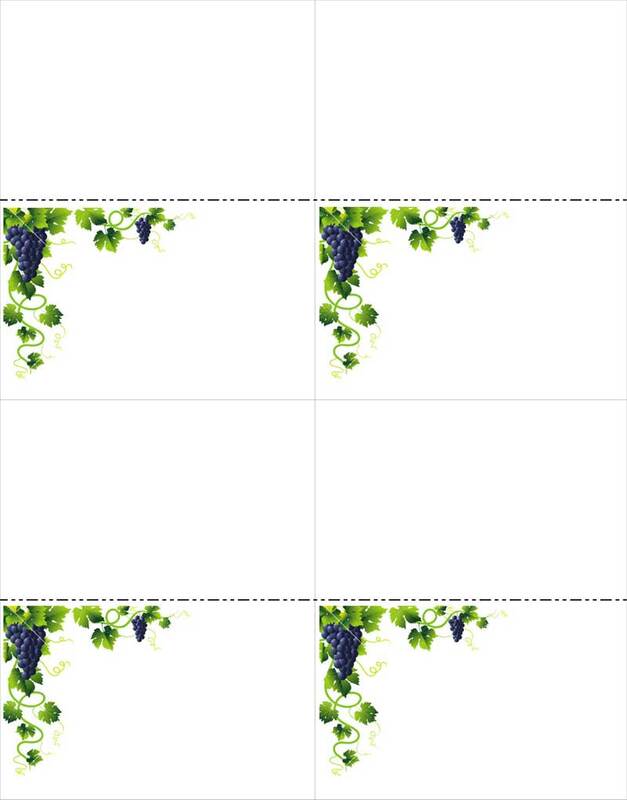 You simply print the place cards using any printer, write in your guests names and fold in half to stand them up. These tent cards are super simple, but add just enough Italian flare to your dinner party. 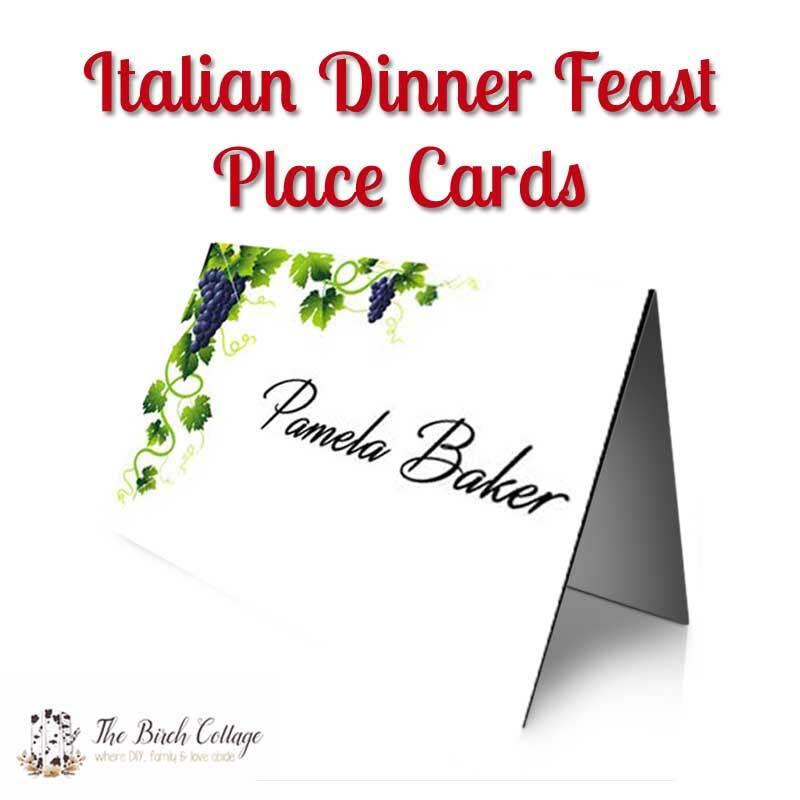 I’ve made these Italian Dinner Feast Place Cards available for download here. They are in PDF format and ready to print! My family loves Italian food, especially our kids. In fact, we just visited our youngest son at college over this past weekend and where do you think he wanted to eat? 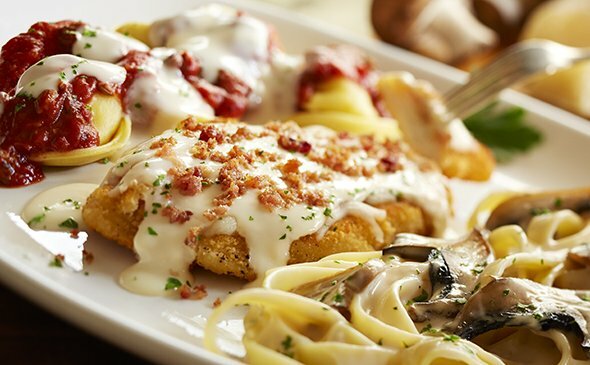 Yep, Olive Garden. I even shared this recipe for Chicken Lombardy a few months ago. It was, of course, an Olive Garden Copycat recipe. Well, I hope these Italian Dinner Feast Name Cards are just the added touch you need to make your Italian themed dinner a huge success! Now, be sure to visit the other blogs in this Italian Dinner Feast Blog Hop! How pretty! Place cards make dinner seem like a special event, don't they? Thanks for the free printable. I love place cards, especially unusual ones - like painted rocks. Adorable! Thanks for the free printable. I'm the pasta e' fagioli post. Glad to participate with you on this fun event! Thanks, Terri! This was a fun change-of-pace event! Place cards always add the perfect finishing touch to a dinner party. Yours are so pretty and I can't wait to print them out and use them for my next Italian themed party. How fantastic! Thanks, Alli! And good luck with your dinner. Hope it's fantastic! Thanks, Susan! I thought they added a nice little touch. Love the place cards, they look great. I love participating with you in this blog hop. Thanks, Rosemary! This really was a fun little blog hop. Hope to see you next time! These place cards are the perfect addition to any meal. Thanks for sharing. I can't wait to use them for next our next family meal. Have a great week. Thanks, Meegan! I hope your next family meal is a great family experience full of good food and fond memories! Barb, that's very sweet! I'm so glad I was able to participate. It was a fun change of pace. Thanks, again, for hosting such a creative blog hop! Thanks, Susie! Place cards are kind of the unexpected added touch. 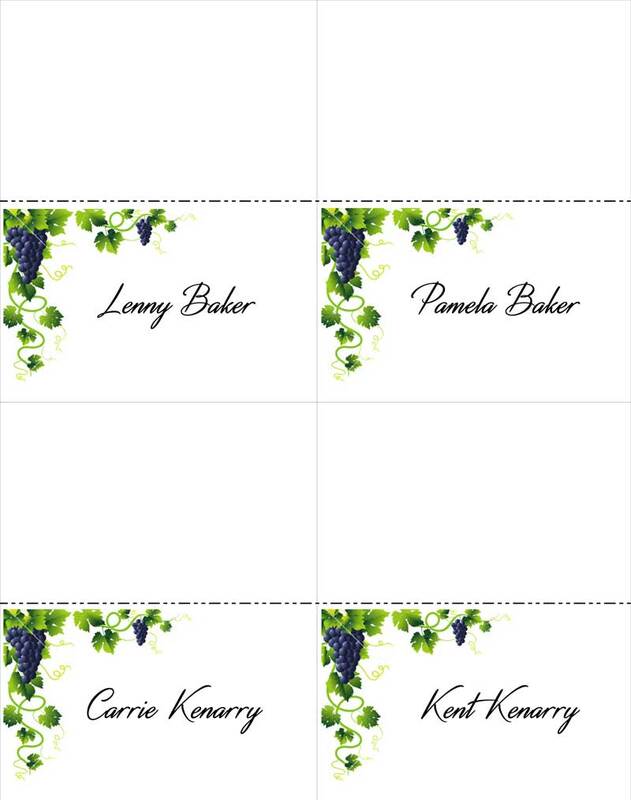 Love the grape design on your place cards!